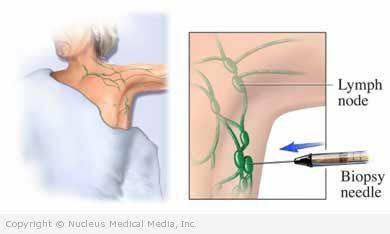 With this type of biopsy, the doctor removes and examines all or part of a lymph node. This biopsy is done to find out why a node is swollen. It can also be done to see if there are cancer cells in the lymph node. The night before, do not eat or drink anything after midnight if you will have general anesthesia. Fine needle biopsy — The doctor will use a thin, hollow needle to obtain tissue samples. Core needle biopsy — The doctor will use a larger needle to cut out a piece of tissue. The doctor may use an ultrasound or CT scan to help locate the biopsy site. An open biopsy means removing the lymph nodes through an incision. The doctor will cut into the skin and remove either all or part of a lymph node. After removal, the incision will be closed with stitches and bandaged. Lymph node biopsy – How Long Will It Take? Lymph node biopsy – How Much Will It Hurt? You will have some pain and tenderness after the biopsy is taken. Your doctor may give you pain medicine. Keep the biopsy site clean and dry. Results will be ready in about a week. Your doctor will tell you if further treatment is needed.